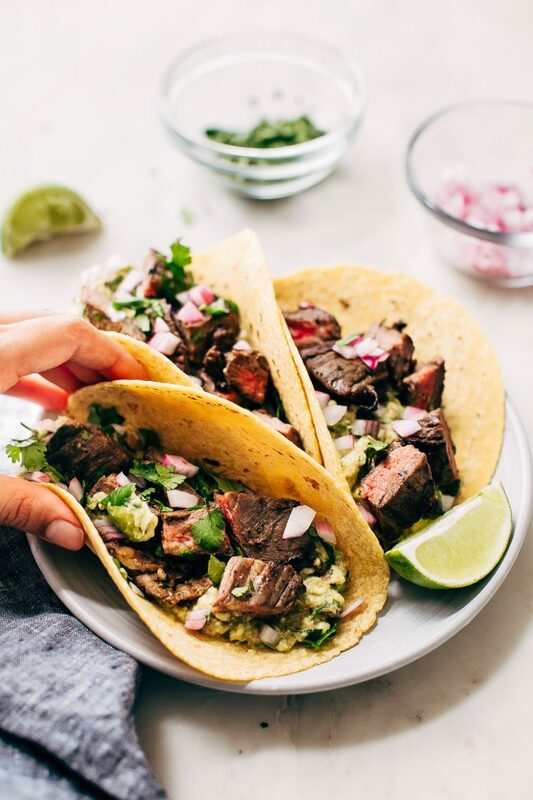 Mojo steak tacos that are as easy as tossing a few ingredients in a bowl and letting them marinate! My mojo steak can be stuffed into your favorite tortillas and topped with all the things you love on tacos or served over rice as a bowl! Brought to you after setting off the fire alarm in our house six times in the middle of the day while the hubby was on a work conference call. Oof! Talk about stressful. You should’ve seen the weird towel dance I did in front of the smoke alarm while I muttered under my breath and praying the darn thing would stop before my ears bled. Our smoke alarm is overly sensitive. It threatens to go off if you even just look at it the wrong way. I know, I know I’m a whole day early for Taco Tuesday. But are you going to be mad at me for bringing you steak tacos at the beginning of the week? We’re talking about tender mojo marinated skirt (or flank) steak that’s sliced on the diagonal, so each little bit melts in your mouth like buttah. If that weren’t enough, I’d top it with a generous dollop of cheaters guacamole. Lighting fast guac is the best thing to ever come out of my kitchen. It’s also quite possibly the most dangerous. I would also like to remind you that this is the perfect opportunity to plan your Cinco de Mayo menu because the stars have finally aligned and the 5th of May is on a Saturdayyyyy! Which means you can celebrate on Friday with coworkers and all weekend long. Forget about work that day and just turn the breakroom into an all-out taco bar. I don’t think anyone could be mad about that. Seriously, do it. Then it’s chips and guac on repeat all weekend long too. 2018 is shaping up to be pretty perfect. 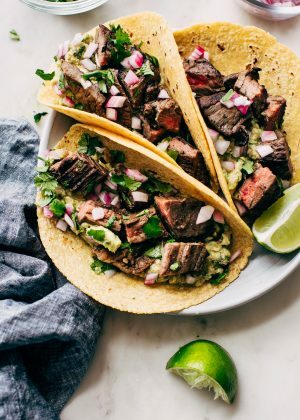 I’m kickin’ it off with a simple marinated mojo steak taco recipe that’s as easy as combining a handful of ingredients and letting the steak marinate for as little as a few or as long as 24 hours. So in case you are planning a big shindig, this recipe will comfortably fit into the prep-everything-in-advance lifestyle. You won’t believe your tongue when you try these mojo steak tacos. 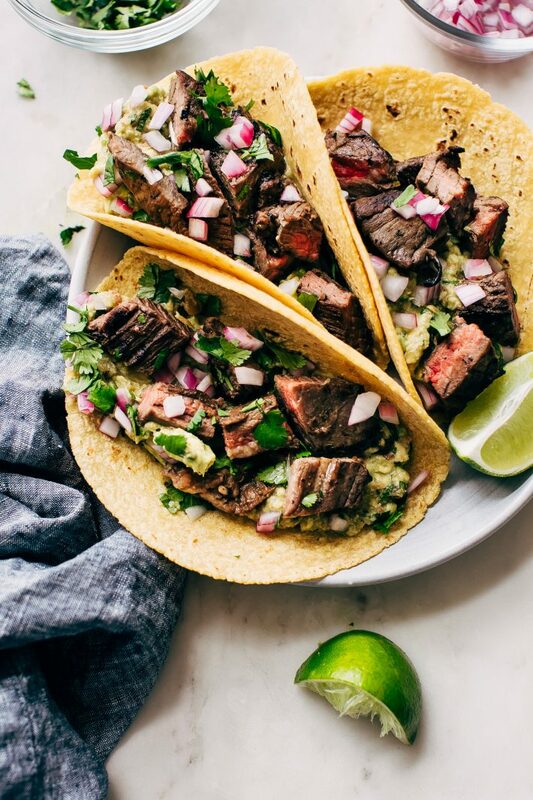 You’ve probably made steak tacos a million times before. Until recently, I was a fan of those fajita or steak seasonings you find at the store. But once I attempted making my own marinade, I kissed those packets of nothing-but-sodium goodbye! 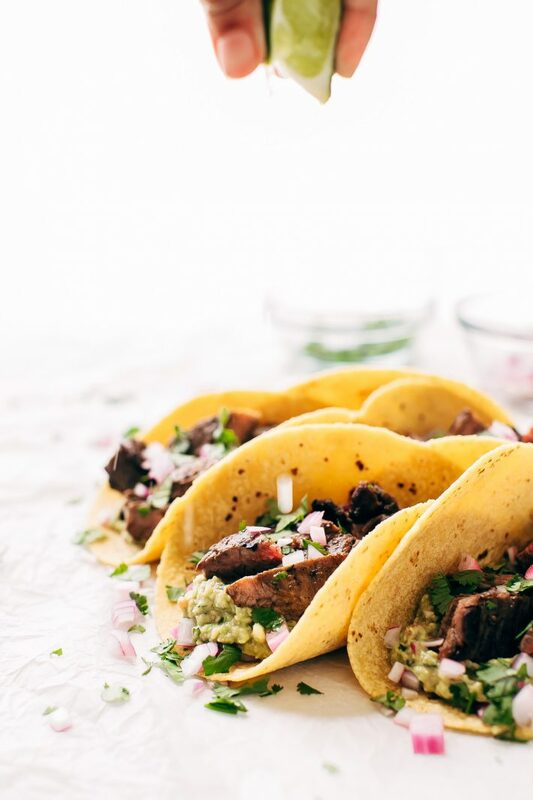 But trust me, you’ve never had tacos like these mojo steak tacos. The marinade is simple, just a handful of simple ingredients that are easy to find. 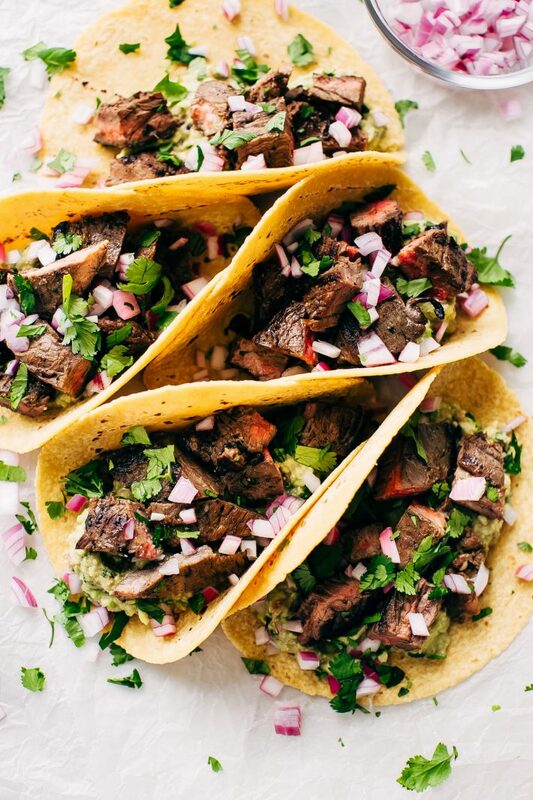 A couple of years ago I shared my steak fajita tacos  with you guys, and you made them, loved them, and dumped your packet fajitas seasonings for them forever. They’re tender, ultra flavorful, and simple to prep. I’m happy to report these mojo steak tacos fit that same bill and offer a little more variety in your steak taco game. 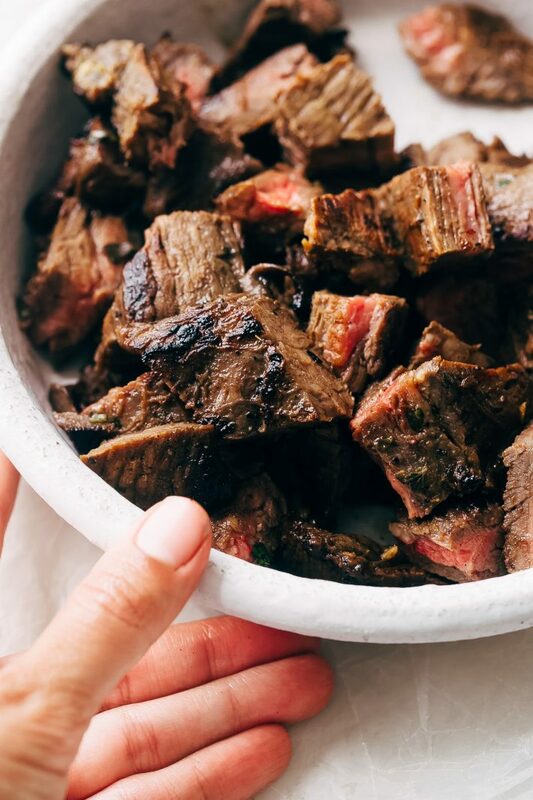 Okay, let’s walk you through this easy mojo steak marinade. There are a couple of ingredients that are I think are considered quintessential when we think about making Cuban mojo marinade. You’ll need oregano, tons of garlic and sour oranges. I don’t know about you, but where I live, we can’t find sour (sometimes called ‘bitter’) oranges regularly so I’m swapping it out for equal parts lime juice and orange juice. Both of these citruses are readily available so that anyone can make these mojo steak tacos, anytime! The lime and orange juice function as acids that aid in tenderizing the steak you’re using. So the longer you marinate, the more tender the meat. The mojo marinade ensures that every bite of your steak is unforgettable! Other than the citrus fruit, you’ll need a generous glug of olive oil, some ground cumin, a handful of cilantro, and either a chopped habanero or some ground cayenne pepper. If you decide to go the habanero route, I suggest tossing the ribs and seeds to prevent it from getting too spicy, unless you like it that way. Then, use a mortar and pestle to mash the garlic and peppers with a little pinch of salt. I don’t know what kind of magic takes place in that vessel but trusttttt. It is worth the effort if you want to dedicate an extra 5 minutes towards the prep work. Of course, for a quicker approach, toss all the ingredients in a bowl, stir, add steak, cover and refrigerate. Honestly, you can make this as effortless as you see fit. I prepared the meat for my mojo steak tacos in my favorite cast iron skillet  (affiliate link), but you can also grill it outside in the summertime. I know we’re planning on doing the same once the rainy season lets up now that we’ve got an outdoor patio dining set. Can you tell I’m itching to put it to good use? I suggest preparing steak on cast iron if you decide to do this indoors. Cast iron heats up and retains it heats well so you can get that perfect sear on the outside without running the risk of overcooking the steak. Once the steak is done, make sure you give it plenty of time to rest. It would be a rookie mistake if you didn’t as all the juices would run right out. That’s all loaded with flavor so you want to try and preserve it. Letting the steak rest does just that. Once the steak has a chance to rest, you can dice it or cut it into strips. Be sure to cut against the grain, so every morsel melts in your mouth. Pro mojo steak taco tip: stuff tons of my quick guac into your mojo steak tacos. This is a cheaters guac recipe, so we’re using a couple of large Haas avocados, along with 1/4 cup of prepared store-bought salsa, the juice of a big lime, some chopped cilantro, and a generous dash of garlic powder and salt. That’s it. The salsa adds that perfect flavor without having to let the guac sit around for those flavors to develop. My hope for you is that you’ll add this to your menu this week, make mojo steak tacos, and then take pictures and share them on Instagram. Tagging me of course along the way, so I can get all sorts of weird glee from looking at your steak taco pictures. Honestly, I loooove it when you do that! STEAK MARINADE: Combine the ingredients for the marinade in a large shallow bowl except for the steak. Give it a taste and check for seasonings, adjust to preference. Coat the steak with the marinade and let sit covered in the refrigerator for at least 3 hours and up to 24 hours. Remove from the refrigerator 30 minute prior to cooking. COOK THE STEAK: Set a large cast iron skillet or pan over high heat and let heat up for a couple of minutes. Add the steak to the pan and cook on each side for about 3-6 minutes or longer depending on the thickness and your preference for doneness. Feel for desired firmness. 4 minutes/side will yield a medium doneness. If the pan becomes too hot, reduce the heat to medium-high. Remove the steak from the pan and allow to rest for several minutes tented with a piece of foil. Slice the meat against the grain into thin slices. If dicing, I like to do so at an angle so the meat cubes are tender. 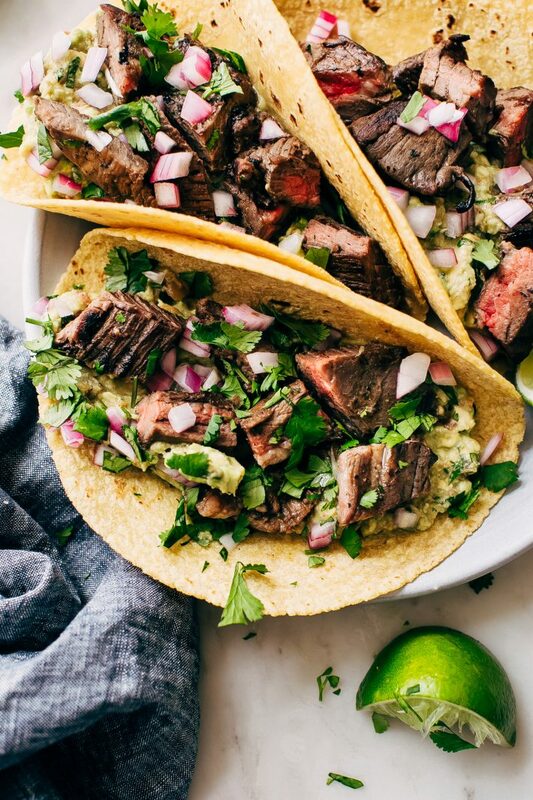 ASSEMBLY: Grab tortillas and spread with my quick guac (recipe in notes), top with the steak, diced onions, cilantro, and squeeze on a little lime! Enjoy! If you decide to go the habanero route, I highly suggest removing the ribs and seeds to control the spice and using a mortar and pestle to mash the garlic, habanero together with a tiny pinch of salt. Seriously, this makes the marinade magical! If you’d like to make the quick guac, you’ll need – 2 large ripe Haas avocados (mashed), a dash of garlic powder, chopped cilantro (to taste), 2-3 tablespoons lime juice, 1/4 cup store-bought salsa, and salt. You can add chopped jalapenos to this as well if you’d like! Combine it all in a bowl and spread in on your warm tortillas before adding all your other taco toppings!